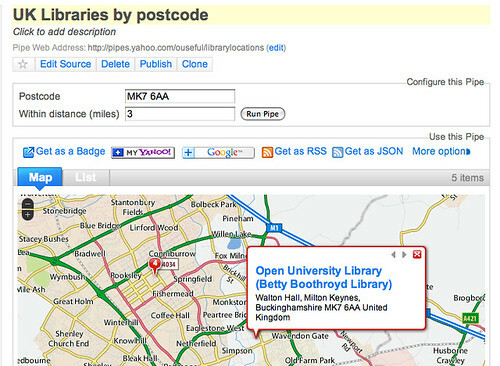 Given your location as postcode, where can you find a list of libraries near you? As with many of these public information style questions, it can be quite hard trying to find a single general answer. 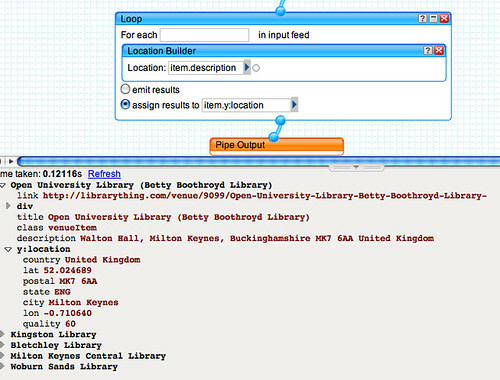 A crude way is to enter a search map along the lines of libraries near POSTCODE into Google Maps, but the results that are returned aren’t necessarily that good… Alternatively, you can go to your local council website, and then do a search there for libraries; but the format in which results are provided can vary; and if you’re a developer, there’s no immediately obvious way of creating (or consuming) a service that will allow you to create a small embeddable map showing the location of libraries in the vicinity of a particular postcode area. At times like this, it’s often worth trying different searches, and clicking different links (such as the “All”, “Bookstore” and “Library” fitlers, as well as the distance setting), to see what happens to the page – whether the URL changes for instance. 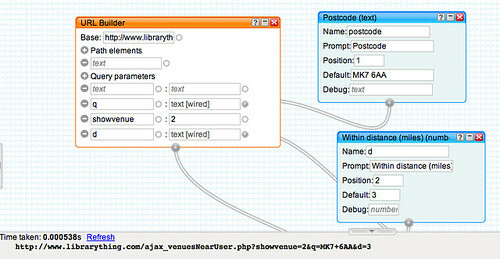 It’s also worth doing a View Source on the page to see if there are any immediately obvious calls to AJAX web services that bring content into the page on those times when a setting change doesn’t cause the page to reload (with or without the same URL), but you suspect that there may have been a call to a webservice somewhere. In the case of LibraryThing Local, clicking the links and changing the settings changed the displayed results without appearing to reload the page, but I wasn’t sure whether the change was just based on data stored within the web page, or whether the information was being pulled in from somewhere else. At this point, I cast my mind around for other tools that might do the job. Google Spreadsheets? No; if the library data was in a table or a list, we might be able to use the importHTML formula, but is isn’t… Maybe I could try to import the HTML as XML…? 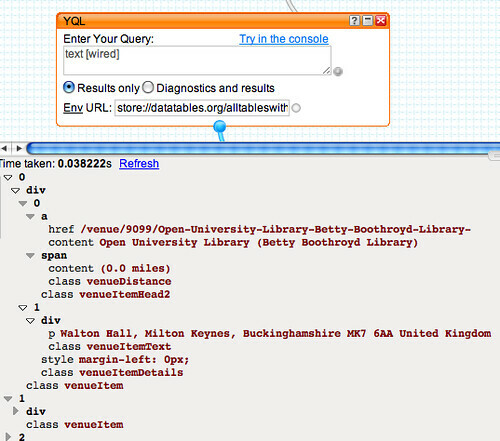 Hmmm… XML… How about I try using YQL to parse the :LibraryThing Local data, and then pull the result into the pipe? Rather conveniently, there is a YQL block available in Yahoo Pipes that can be provided with a YQL query and will pull the result back into the Pipes environment. Now the pipework can begin… but what do we want it to do? The reason we use a Create URL block is so that the postcode is automatically escaped (e.g. 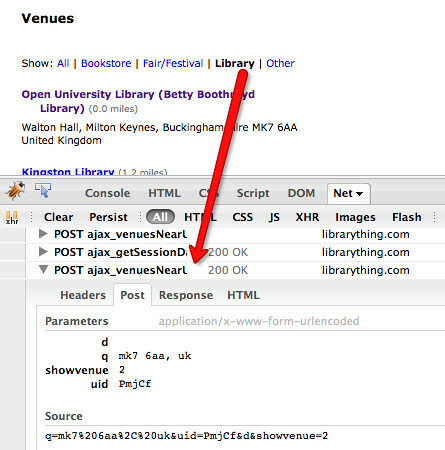 if the user places space characters in the postcode when they enter it, these need handling appropriately). For details on how to use the output of this pipe to create your own embeddable maps, see the second half of 5 Minute Hack – UK Centres Online Map, in particular how to take the KML output of the pipe and use it to display the results in an embeddable Google map. I really do like your “showing the process” posts.